Product Details: No Sugar. No Preservatives. Healthy Energy. Accelerates Metabolism. Burns Body Fat. Gluten Free. Kosher. Non GMO. No High Fructose Corn Syrup. No Aspartame. No Artificial Colors or Flavors. 100% Of 7 Essential Vitamins. Proven In 6 Published University Studies. How Does It Work? 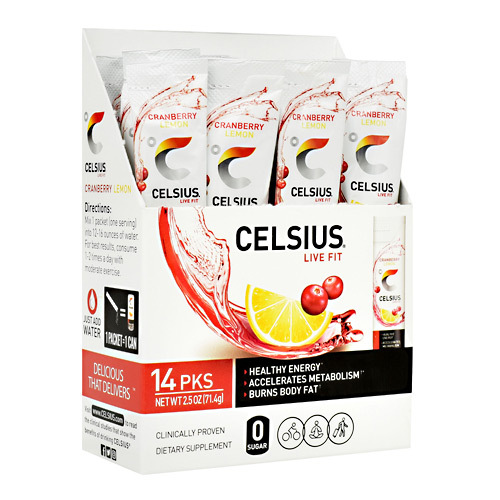 Celsius Proprietary MetaPlus Formula Including Green Tea With EGCG, Ginger And Guarana Seed Turns On Thermogenesis, A Process That Boosts Your Body's Metabolic Rate. 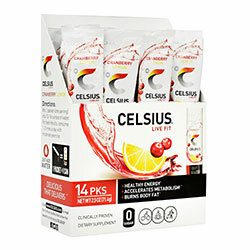 Drinking Celsius Prior To Fitness Activities Is Proven To Energize, Accelerate Metabolism, Burn Body Fat And Calories. Invest In Yourself, Drink Celsius. Other Ingredients: Citric Acid, Black Tea Powder, Sucralose, Vegetable Juice Powder For Color, Natural Flavor, Sodium Bicarbonate, Cranberry Juice Powder.